of the Missionary College of Antonio Rosmini. from 7:30 am to 12:30 pm and from 3 pm. to 6 pm. 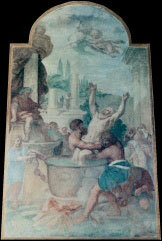 Weekdays and Saturday: 6:45 (In the Chapel of the Collegio Rosmini. During Mass on Sundays and Feast Days a priest will be available for Confessions. On weekdays pleas ring at the door of the College. 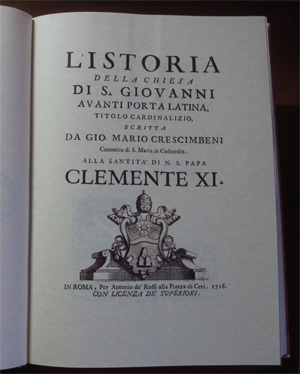 printed in 1716, by Giovanni Mario Crescimbeni. This is available from the church office, reprinted in a restored format.